This month I am reviewing a book to help you in downsizing yourself but probably someone else in your life. 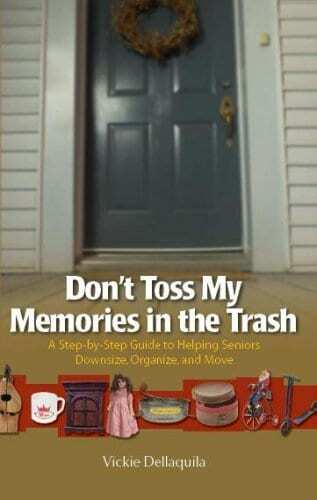 Don’t Toss my Memories in the Trash by Vickie Dellaquilia. Guide to help downsize a loved one. This book has very practical steps and suggestions for downsizing in many different types of situations. The person maybe moving to a smaller house, an apartment, moving in with family members or to a seniors home. In each situation the person is losing something and must learn to adapt to a new living situation. They may need to get use to meeting new people, having less privacy, being less independent. This book guides the caregivers to avoid pitfalls that can occur. 1.Giving up the family home is like losing a loved one. When the family is gone the memories are all they have left. 2. Remember the goal is to get the parents resettled with the things they love that make them happy and comfortable. It is not about the finances of selling stuff, emotional battles over a childhood or arguments between family members. 3. Consider how much energy and time you have for the job. Children sometimes have a small window of opportunity to help and want to do it in a week when parents need to go more slowly. 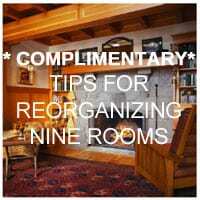 Get help with moving, selling items, removing junk you don’t have to do it all yourself. 5. Take pictures of how a room is set up, how things are on the dresser or in the bathroom. At the new place you can replicate the situation so they can adjust more quickly. 6. Have sheets of packing paper and use them to simulate the furniture and assess what large items can be moved and where they will fit in the room. A visual representation can make decisions easier. It is a great, quick, easy to read resource. Parents will often offer their kids things they can’t take to their new home. Be careful you don’t take a bunch of stuff you don’t need and don’t have room for (duplicates of household items you already own, for example). On the other hand, if your parent is really attached to something they don’t have room for, and it won’t be in your way, taking it home might make them feel a lot better about letting it go. You can always dispose of it or find a new home for it after they’re gone. I agree, sometimes I encourage family members to take things because it makes it easier for the parent to start letting go of things. However if I feel it is too big a burden on the child, psychologically or physical space, to take it then we find a different way. I love Vickie’s book. I’ve helped many families through this process. And sooner than later, I’ll be going through it too. My mother still lives in the home I grew up in. It’s always been there. I know that it won’t always be. I love the idea of having a goodbye ceremony. I am working with my dad on this process. We are not in a hurry but it is still very difficult to find just the right way to do it to keep all family members happy. Great review post. I have to get the book. This is a passion of mine. I have worked with several downsizing individuals and parents and found the best way to downsize is to honor the very special things they have. I have seen clients create quilts for their kids of clothing from their childhood. I also saw people take pictures of the objects they gave away. I have seen people frame their favorite things. As POs, we can motivate our clients to give stuff away but giving them suggestions on what they can do to honor these items. Sometimes I think we need to slow family members down so they can consider how to honour items in a way that works for everyone. Unfortunately I usually see family members not having a lot time and wanting to move things along very quickly. This sounds like a wonderful resource. I was thankful that my brother in law took photos of my parents’ home before they sold it. I think taking the time to sort through all of the memories… to just sit and savor them together.. can be a service we as organizers and move managers provide. As you said, children often don’t have the time to do that, but the senior benefits if he/she is able to process and bring closure. I certainly agree that processing a move takes time and if the person can be given that time, closure is much easier and so is moving onto the next new and exciting event. I hope you will enjoy it as much as I did. Keep the memories that are special to you not the ones you think you are responsible for keeping. I haven’t read this book as I haven’t worked with seniors or had to help a family downsize, but it sounds like a wonderful resource to share with others. Thanks for a wonderful review! I am glad you enjoyed the review. It is always handy to have resources on hand.